I have had my eye on the incredibly stylish baby clothing line - Green Cotton. Funny how when you have babies you stop noticing the cute clothes for yourself and instead ogle the adorable baby clothes (me at least!). I am really thankful to the Vyssan Lull boutique for providing a Green Cotton Velvet Hooded Jacket for this review. 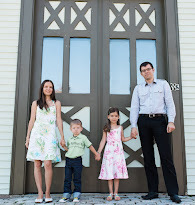 Just a word about Vyssan Lull first, their selection of the best non-toxic baby clothing is incredible. As you may know, the Europeans are way ahead of us when it comes to sustainable fabrics without pesticides, hence you will see a lot of European and primarily Scandinavian brands on the site. The likes of Roda Hund, Sture & Lisa, Maxomorra, Duns, and Gegamoja are there. They have a well stocked sale section to make organic more affordable. Read to the end to enter to win your choice of item from the sale section! 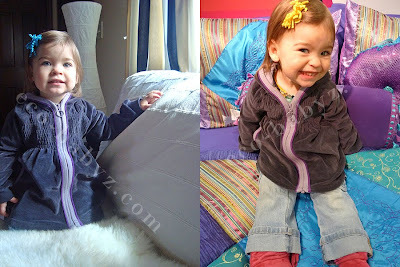 Fit & Design: This jacket is just splendid, made exactly right for little girls. My favorite thing is that it is cut in such a way that it looks great even if it is a little big, which for frugal moi means baby E can wear it for several seasons! I wasn't sure of the Iron color, on the website I thought it was black. When it arrived I was pleasantly surprised by the dark plum/gray color. It isn't bright, so it matches nearly everything. The photo on the left above most closely shows the actual color. 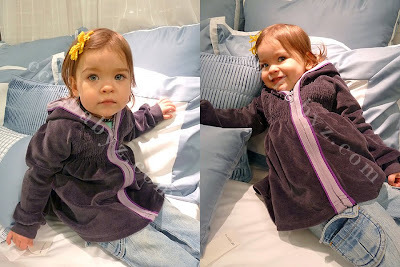 Quality & Value: This jacket is something that you would find at an upscale baby boutique. It is very high quality and I can't even think of a well known brand that I can compare it to. The organic cotton is soooo soft. The Velvet Hooded Jacket retail price is $62, but it is on sale at Vyssan Lull right now for $44. It also comes in pink! How is this green: Organic cotton is grown without pesticides. Who would you recommend this to? For a sweet little girl who needs a versatile jacket to wear year round. A timeless piece that grows with the baby and matches any wardrobe. One Eco-Babyz reader will be blessed with an item of your choice from the Vyssan Lull sale section! Mandatory Entry: Follow Eco-Babyz with GFC (blogger) AND visit the Vyssan Lull sale section to tell us what item you would choose if you win. Contest ends at 11:59 pm on Monday, April 18th, 2011. Winner will be selected using Random.org and contacted via email. Open to US residents 18+. I follow you and I would pick the Girls Pocket Dress Stripes. I like the girls dot tunic. I follow I like the Baby Tunic Stars. I like their body suits, especially Stars pattern by Green Cotton. I'd probably choose the girl's striped tunic. The site is loading so slowly I can't see all the options, but everything I can see is adorable! I "like" Vyssan Lull on FB, my FB name is Vicki Sh. i rated your blog a 10! and thats an honest one! I follow you via GFC and I like the sunhats! I follow and I would love Girls Pocket Dress Stripes! I follow you on GFC & love the Baby Velvet Jacket in Jade. I follow your blog. I'd pick the Jumpsuit in Cirkus Goldenrod. I subscribe to the Vyssan Lull newsletter. I follow Eco Babyz on twitter @Aerated. I voted on Pickect Fence Blogs. The hooded velvet suit in Jade is so cute! Hard to decide! I like the Goldrenrod Circus dress, the Jade velvet jacket AND the Nowali Mocassins!!! ((1955nursehjc4me(at)myway(dot)com)) Thanks! I voted/rated yr blog on Top Mommy blogs ((1955nursehjc4me(at)myway(dot)com)) Nice blog!!! I "LIKE" you on FB (HollyCunningham), hope you get to 1,000 soon!!! ((1955nursehjc4me(at)myway(dot)com)) Thanks for the giveaway!!! I love the Traffic bodysuit! I follow you and I love the snuggly sleepers! So cute! I like the Baby Tunic Stars. I follow and I love the Girls Pocket Dress Stripes! I'm a GFC follower :) The Little Hearts bodysuit is super cute! I like the velvet jacket in iron. I follow you via Google Friend Connect (Sewmuchstuff) and I would choose the Hooded Velvet Suit Pink. Thank you for the wonderful giveaway! I follow via GFC and I would choose the Bodysuit Goldenrod Cirkus onesie! I like the girls tunic in goldenrod! Velvet Hooded Jacket Iron 2-3yrs.